I greatly enjoyed attending the RGSA annual meeting Saturday. Meeting Bill, Robin, Had, Steve, Mike, and the others in attendance was well worth the 11 hour trip from SoCal. Earlier in the day Bill had taken Bob K and myself on a tour of two of your sites - Mag Rim and Volcanic Peak. Bob and I walked up to the launch at Mag and sincerely hope the club can get permission for a gate. Tough enough hike without a glider Disappointed that we didn't get to see the resident rattlesnake at Vol Peak. I'm proud to be a member of RGSA now and hope to get back to NM again. Thanks for the kind reception and the good discussion. USHPA could learn a lot about member relations from the RGSA. I've attached the proposed Bylaw changes that Bill and several of us had proposed to the club. As I recall, these were each passed substantially as they were written. It would be good to post the final version here as well. The Rio Grande Soaring Association, Inc. is a non-profit corporation which functions principally in the southern portion of New Mexico. 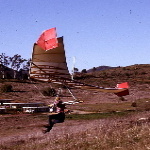 The primary purpose of the corporation is to promote the education and safety of hang glider pilots as well as the general public's understanding of the sport. 1. Full Membership includes the right to vote on Corporation affairs, hold office and, upon qualification, have the right to fly at sites controlled by the corporation. A subscription to the newsletter is included. 2. Associate Members are permitted to attend all club functions and may fly at sites controlled by the corporation. B. Admission. All applicants for full membership are encouraged to must also be members of the United States Hang Gliding and Paragliding Association (USHPGA) and other organizations that the Board might recommend from time to time. An applicant shall be admitted to full membership in the Corporation only on making application therefor, meeting those requirements set by the officers, and payment of dues. Applicants for Associate membership shall be accepted upon payment of dues. In order to remain compliant with USHPA's Chapter requirements, a percentage of RGSA's Full Membership members must also be current USHPA members. That percentage may change from time to time, and will be referred to in these bylaws as the “USHPA Percentage” (currently 70% at the time of this revision). The RGSA shall limit its Full Membership to at all times maintain the “USHPA Percentage” of current USHPA members. This limitation shall be done by removing full members from the Full Membership roster and placing them on the Associate Membership roster in order to satisfy the USHPA Percentage for Full Members. The removal of members from the Full Membership roster shall proceed in order starting with the most recent applicant to the RGSA and proceeding toward the most senior applicant to the RGSA. This has the effect of maintaining senior members who may drop their USHPA membership. It also has the effect of encouraging new RGSA applicants to benefit from being USHPA members. office, have his or her membership suspended for a period, or be expelled from the Corporation for cause, such as violation of any of these Bylaws or violation of flight regulations or other rules of the Corporation or for conduct prejudicial to the Interest of the Corporation. Such action shall require a two-thirds (2/3) vote of all the voting members at two consecutive a regular meetings, provided that a statement of the charges and a notice of the time and place of the meeting have been mailed to the member at least thirty seven (307) days prior to the meeting, and that the member will have an opportunity to present a defense at the meeting. D. Transfer of Membership. Membership in this Corporation is not transferable or assignable. E. Termination of Membership. Membership shall terminate on the death or resignation of a member or upon termination by the Corporation (in accordance with Article II, Section C of these Bylaws) or after expiration of the annual dues. On Such termination any right, title or interest of the membership in or to the property and assets of the Corporation shall cease. All members who are renewed after any such termination shall retain their original application date with respect to Article II, Section B of these Bylaws. A. Annual Dues. The Board of Directors may determine from time to time the amount of the initiation fee, if any, and the amount of annual dues payable to the Corporation by full and associate members. B. Payment of Dues and Fees. Annual dues shall become payable on the first day of the calendar year. C. Default and Termination of Membership. When any member of the Corporation shall be in default in the payment of dues for a period of (3) months from the date on which dues became payable, his or her membership may be terminated by the officers as provided in Article I of these Bylaws. A. Annual Meeting. An annual meeting of the members shall be held on the last Saturday in the month of January in each year beginning with the year 1993, at the hour of 7:00 p.m. and at the regular location, for the purpose of electing officers and for the transaction of such other business as may come before the meeting. If the election of officers shall not be held on the day designated herein for any annual meeting, the officers shall cause the election to be held at a special meeting of the members as soon thereafter as conveniently may be done. B. Regular Meetings. Monthly meetings shall be held on the last Saturday of each month and at a regular location established by the officers. C. Quorum. Members holding one fifth (1/5) of the votes entitled to be cast on the matter to be voted upon represented in person shall constitute a quorum. A majority of the votes entitled to be cast on a matter to be voted upon by the members present at a meeting at which a quorum is present shall be necessary for the adoption thereof unless a greater proportion is required by the aArticles orf Incorporation orf these Bylaws. D. Notice of Members' Meetings. 1. Unless otherwise provided in the articles of incorporation or by the Bylaws, written notice stating the place, day and hour of the meeting, and in case of a special meeting, the purpose or purposes of which the meeting is called, shall be delivered not less than five (5) nor more than fifty (50) days before the date of the meeting, either personally or by mail or by email, by or at the direction of the President, or the Secretary/Treasurer, or the officers or persons calling the meeting, to each member entitled to vote at the meeting. If mailed, the notice shall be deemed to be delivered when deposited in the United States mail addressed to the member at his or her address as it appears on the record of the Corporation, with postage thereon prepaid. 2. Attendance at any meeting by a member shall constitute a waiver of notice of the meeting, except where a member attends a meeting for the expressed purpose of objecting to the transaction of any business because the meeting is not lawfully called or convened. A. Directors. The Directors of the Corporation shall consist of a President, a Vice-President, a Secretary/Treasurer, a Safety Officer, and a Newsletter Editor. B. Election and Terms. The President, Vice-President, Secretary/Treasurer, Safety Officer and Newsletter Editor shall be elected by a majority of the voting members of the annual meeting and shall hold office for a period of twelve (12) months or until their successors are elected. There shall be no limit to the number of terms each officer may serve. C. President. The President shall be the principal executive officer of the Corporation and shall in general, supervise and control all the business and affairs of the Corporation. He or she shall preside at all meetings of the members. He or she may sign any deeds, mortgages, bonds, contracts or other instruments that the officers have authorized to be executed. In general, he or she shall perform all duties incident to the office of President and such other duties as may be prescribed by the Corporation. D. Vice-President. The Vice-President shall be in charge of parliamentary procedure at all regular Corporation meetings. He or she is the co-chairperson of all Association committees. In absence of the President or in the event of his or her inability or refusal to act, the Vice-President shall perform the duties of the President and shall have all the powers of and be subject to any and all restrictions on the President. E. Secretary/Treasurer. The Secretary/Treasurer shall keep the minutes of the meetings of the members, see that all notices are duly given in accordance with these Bylaws or as required by law, be custodian of the Corporation records, keep a register of the post office address, phone number, and email address of each member, and, in general, perform all duties that may be assigned by the President, and shall have charge and custody of and be responsible for all funds and securities of the Corporation, receive and give receipts for monies due and payable to the Corporation from any source whatsoever and deposit all such monies in the name of the Corporation in such banks, trusts, companies or other depositories as shall be selected by the officers, and shall perform such other duties as may be iencident to the office of Treasurer. A. Contracts. The President may authorize any officer or officers, agent or agents of the Corporation in addition to the officers so authorized by the Bylaws, to enter into any contract or execute and deliver any instrument in the name and on behalf of the Corporation. Such authority may be general or confined to specific instances. B. Checks, Drafts or Orders for Payment. All checks, drafts or orders for payment of money, notes or other evidence of indebtedness issued in the name of the Corporation shall be signed by such officers or agents of the Corporation and in such manner as from time to time be determined by the officers. C. Deposits. All funds of the Association shall be deposited from time to time to the credit of the Association ins such banks, trust companies or other depositories as the officers may select. D. Gifts. The directors may accept on behalf of the Corporation any contribution, gift, bequest or device for the general purpose or special purposes of the Corporation. E. Assets. The assets of the club shall include all physical items owned by the Corporation along with intellectual property to include web sites and domain names. All such assets shall be registered either directly to the Corporation or in the name of an officer for convenience. Any such assets registered in the name of any officer shall remain under the direction of the Board and shall be re-registered to the Corporation upon a majority vote of the Board. A. Amendments. The Bylaws of this Association may be amended, repealed, added to or new Bylaws may be adopted by the vote or written assent of the majority of the members ientitled to vote or a two-thirds (2/3) majority of a quorum at a regular Corporation meeting. B. Attachments. Copies of all current rules and guidelines as established shall be permanently attached to these Bylaws. The Secretary/Treasurer shall be responsible for updating these copies as the situation demands. A. Controlling Law. These Bylaws shall be interpreted, governed and construed under the laws of New Mexico. B. Severability. If any provision of these Bylaws or any part thereof is declared invalid by any court of competent jurisdiction, such action shall not affect the validity of these Bylaws, and the remainder of these Bylaws shall remain in full force and effect according to the terms of the remaining provisions or parts of provisions hereof. These Bylaws were adopted by Rio Grande Soaring Association, Inc. on this 4th day of April, 1992. These Bylaws were amended by the Rio Grande Soaring Association, Inc. on this 20th day of January, 2018.